Rudyard Kipling was born in India and spent the first six years of his childhood there. After about ten years in England, he went back to India and worked there for about six-and-a-half years. These stories were written when Kipling lived in Vermont. There is evidence that it was written for his daughter Josephine, who died in 1899 aged six. Kipling put nearly everything he knew or "heard or dreamed about the Indian jungle". The Jungle Book is an upcoming American live-action/CGI film directed by Jon Favreau, written by Justin Marks, and distributed by Walt Disney Pictures. The film's executive producers are Molly Allen, Karen Gilchrist, Peter M. Tobyanse. Music will be written by John Debney. The film will be released in 3D and open on April 15, 2016. Filming began on August 5, 2014. As a part of Saturday August 15, at D23 Expo, Walt Disney Pictures presented their highly-anticipated adaptation of The Jungle Book in front of a packed crowd in Hall D23 of the Anaheim Convention Center, with director Jon Favreau, stars Neel Sethi, Ben Kingsley and Lupita Nyong'o. The Jungle Book also features the voices of Bill Murray (Baloo), Idris Elba (Shere Khan), Scarlett Johansson (Kaa), Giancarlo Esposito (Akela) and Christopher Walken (King Louie). 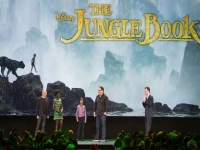 Neel Sethi (playing Mowgli) will be the only actor to be featured in live-action, with the rest of the cast members merely providing their voices for these iconic characters.